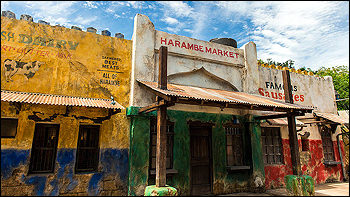 Choose from a quartet of unique locations offering food and refreshments that reflect the spirit of Harambe! Constructed around an old colonial-era train depot and lorded over by an iconic water tower, this active marketplace showcases distinct personalities and diverse menus—created using produce and raw goods delivered daily by the local locomotive. After you’ve paid a visit to one or more windows, simply find yourself a table beneath ample shaded seating. Then, relax, eat and enjoy! Dannon® Danimals® Yogurt, Apple Wedges, Carrot Sticks, Goldfish Crackers, Apple-Cinnamon Snack Bar and choice of small Lowfat Milk or small Dasani® Water.